count the number of records and display the total (count) at the end of the report. This example prints the Quiz reserved words from the quiz dictionary and the definition for each word. The total number of the name and definition fields will display at the end of the report. 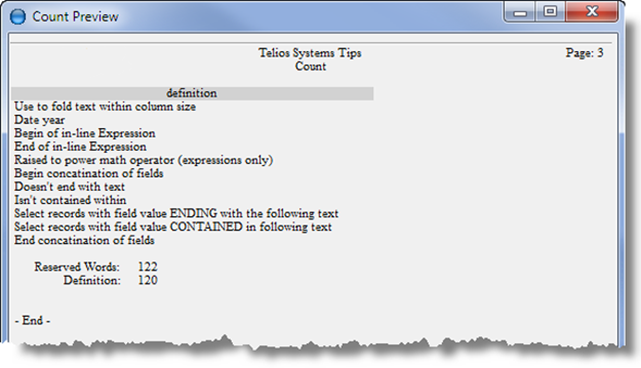 The count word is entered as one of the arguments or modifiers after the field to be counted. 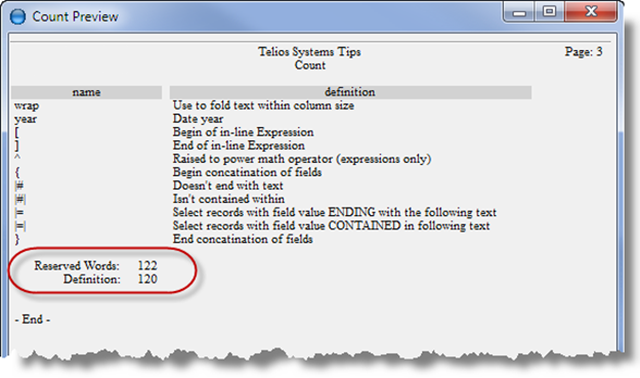 wrap — if the field is greater than 60 characters, put the next 60 characters on the next line in the same column until all the data is printed. caption — optional label. Without the caption the count will be labeled by the name of the counted field. There are 122 reserved words, with 120 unique definitions. That brings up another consideration. count does not count exact duplicates of the field being counted. So even though there are 122 unique names, there are only 120 unique definitions. The name field doesn’t print.